Stewart Contract Services began in January 1999, after many years working in the exhibition industry. We originally started out from our base in South London before relocating to Hastings in East Sussex in 2003. Our work has in the past mainly been generated through recommendation or word of mouth. We are a small independent exhibition company with more than 20 years experience in the industry. 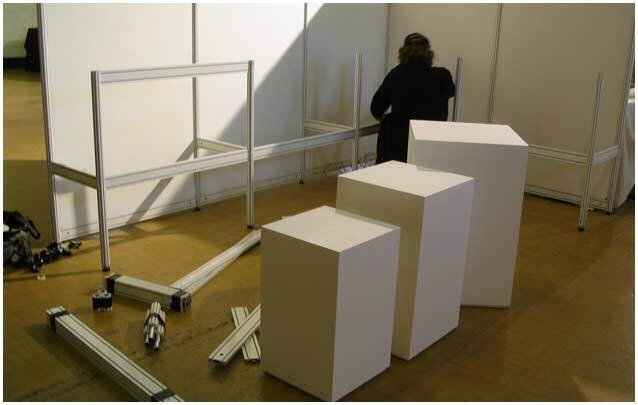 No job is to small, from a single Artists display stand at an Art Fair to creating a pod of plinths for a Sculptor. No job is too large either. We can cater for up to 100 exhibition stands and more if necessary. As we are a small firm we have been able to keep our prices very competitive, the only aspect we ask our clients to take into consideration is the logistics and distance to the installation. Our traditional system is suitable for hanging artwork, as we allow fixtures and fittings to be screwed into the panels. This is normally not allowed on bolt together exhibition systems, where the surfaces cannot be attached to/hung from. We assemble the panels on site by nailing and bracing, to whatever layout the organiser designs. We advise and help with the logistics and the suitability of the layout, bearing in mind the venue, access, health and safety. We can supply your entire exhibition needs including: transport, installation, electric, power points, lighting, floors, raised platforms, plinths, false ceilings, furniture, help and advice. We also offer a full design/build exhibition stand service, please contact us for further details.